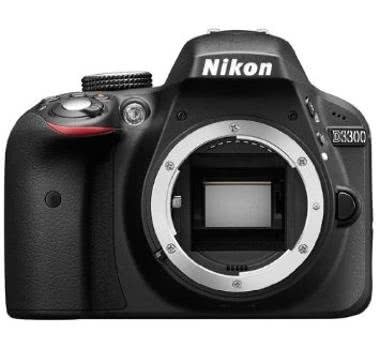 The Nikon D3300 Digital SLR Camera offers movie recording in 1080p up to 60 FPS and the option to record audio either in-camera or using an external microphone (mic not included). Control multiple off-camera Nikon flashes directly from the D3300 with Nikon's Creative Lighting System for high-quality studio shooting. Low-light sensitivity has been expanded from previous models to go all the way up to ISO 25600 and this camera also sports a slight boost in shooting speed (up to 5 FPS). A variety of in-camera modes and editing features makes this a fun camera to shoot both fully-manual RAW images with in addition to creative, casual shooting. This camera is suited for videography, candids, events, and travel.